You Can Make a Difference with a Contribution to Our First Annual Summer Appeal! Avi lives in Sderot, a town that is often the target of rocket attacks. His mom, Rena, is a single parent who needs to work long hours to support her family. She has chosen a NA’AMAT Multi-Purpose day care center for many reasons. At the day care center, Avi is cared for by a loving staff. There, he spends his days filled with activities that include music, arts and crafts, storytelling and both indoor and outdoor play. Nutritious meals are served to Avi and his sister Shosh, who comes to the center at the end of her school day. Extended hours are also provided to accommodate Rena’s work day schedule. In addition, tuition is based on a sliding scale, so parents pay only what they can afford. Multi-purpose day care centers like the one Avi attends, provide a warm and secure environment. Individual attention is given to children who have been abused, traumatized by terrorism, or who have come from homes afflicted by poverty or other difficult family situations. Professionally trained staff including counselors, teachers, and psychologists, work with families to provide the social and academic support each child needs, as well as the love and care that each child deserves. 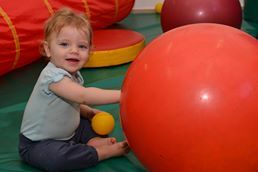 NA’AMAT is proud of its 233 daycare centers that are located throughout the State of Israel. With your help, we can continue to ensure the safety and security of our 17,000 pre-school children and the 40,000 families who depend on us! Join us in making a difference for Avi and other children like him with a contribution to our Annual Summer Appeal. Support Our Summer Appeal Today!